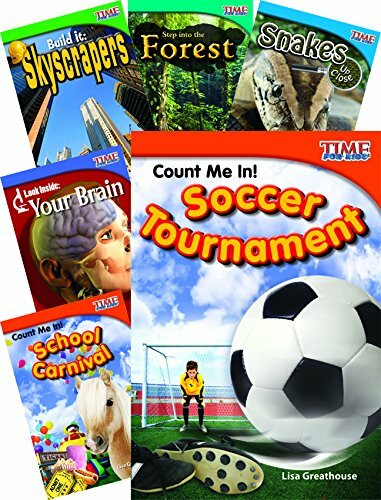 This 10-book STEM collection for Grade 2 pulls together informational text for math, science, technology, and engineering in engaging formats that include TIME FOR KIDS content, vivid images, and descriptive vocabulary. Each colorful nonfiction reader in this collection will keep children engaged from beginning to end. Titles in this collection include: Count Me In! School Carnival (Math); Count Me In! Soccer Tournament (Math); Count Me In! What's for Lunch? (Math); Tornadoes and Hurricanes (Science); Volcanoes! (Science); Snakes Up Close (Science); Step into the Forest (Science); Our Earth (Science); Look Inside: Your Brain (Science); Build It: Skyscrapers (Math, Science, Technology, Engineering).